Float Fest, “the only festival in the world to combine the Texas tradition of floating the San Marcos river, live music, camping, and a carnival,” returns on July 22 and 23 to the Cool River Ranch in San Marcos, Texas. 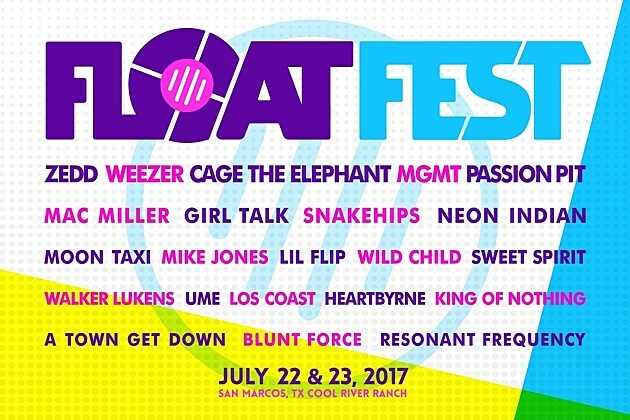 The fest has two stages with no overlapping sets, and a lineup that includes Passion Pit (who just released a new album), MGMT (who should be releasing one soon), Weezer, Neon Indian, Mike Jones, Mac Miller, Girl Talk, Zedd, Cage the Elephant, and more. Last year, the fest had a permit blocked after “anti-tuber backlash” but it will go on as planned. Festival passes are on sale now. The “fanatic pass” includes tubing and camping.